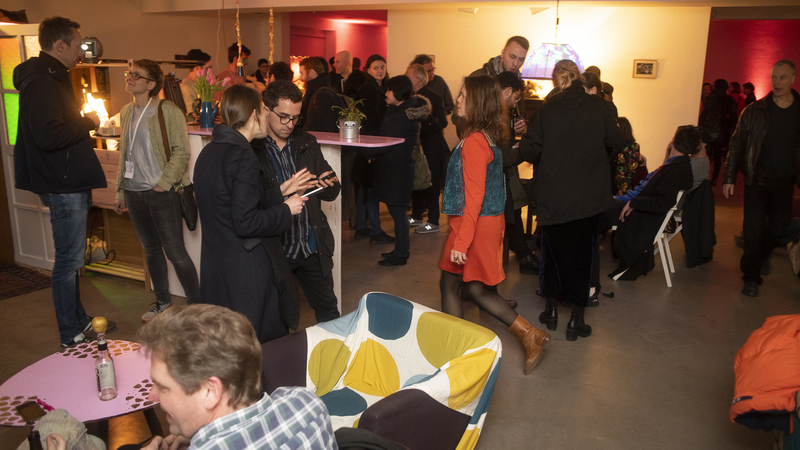 The VIDEONALE.17 opening was accompanied by an extensive four day festival program from Feb 21 to 24, 2019 open for professionals and the interested public. 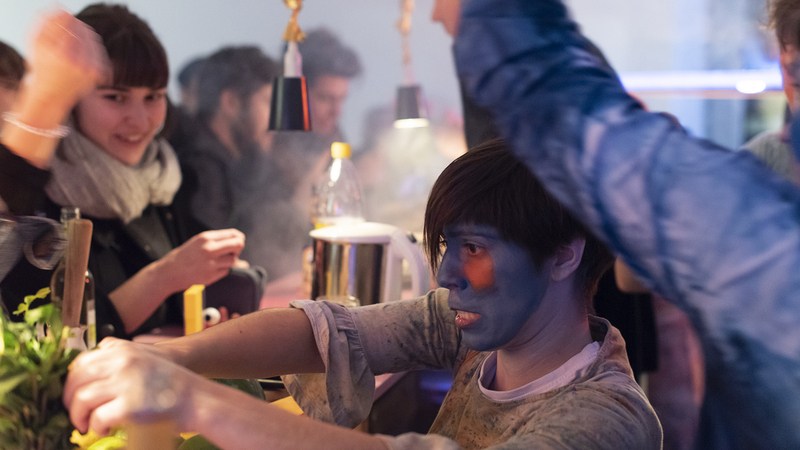 In a variety of event formats, including lectures, panels, and performances, as well as workshops and video screenings, the thematic focus on REFRACTED REALITIES was elucidated as comprehensively and diversely as possible. We would like to thank all guests and visitors for these inspiring days! The entrance to all events of the festival program was free of charge. Unless otherwise stated, the events were conducted in English. During the opening ceremony an outstanding work will be awarded the Videonale Award of fluentum collection. Maryna Makarenko's sound performance ›Tuning of the world‹ is a continuation of her film ›Jellyfish‹, which will be shown in the V.17 Exhibition . Our international guests from the arts and cultural sector will be available for personal conversations in short and concentrated rounds. The speed dating exclusively addresses artists. The panel highlights various historical artistic positions that have produced innovative works in the field of the time-based arts using then-new technologies in collaboration with technicians and engineers. »Experiments in Arts and Technology« (founded in 1967), the TV show »Black Gate Cologne« (WDR, 1969), or the »Direct Media Association« (founded in 1978) are examples of the rapidly developing relations between art and technology. Their tangible influence on time-based art forms until today will also be discussed. Note: A program with works by the projects presented in the panel will be shown in the small auditorium all day long. 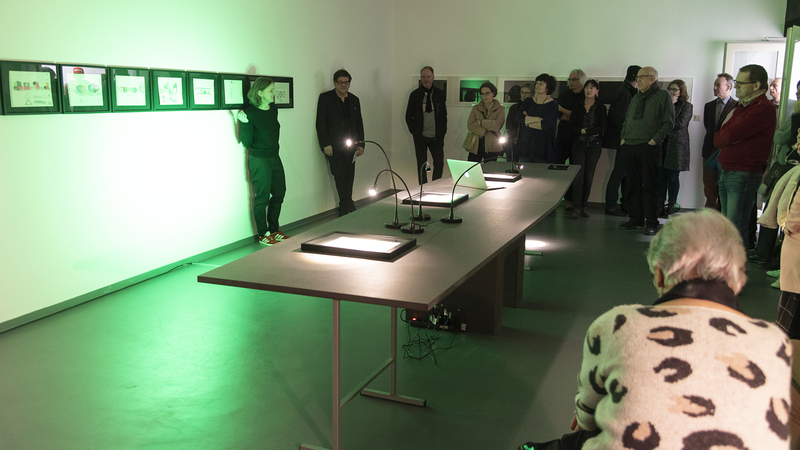 Members of the V.17 competition jury speak about the presented works. 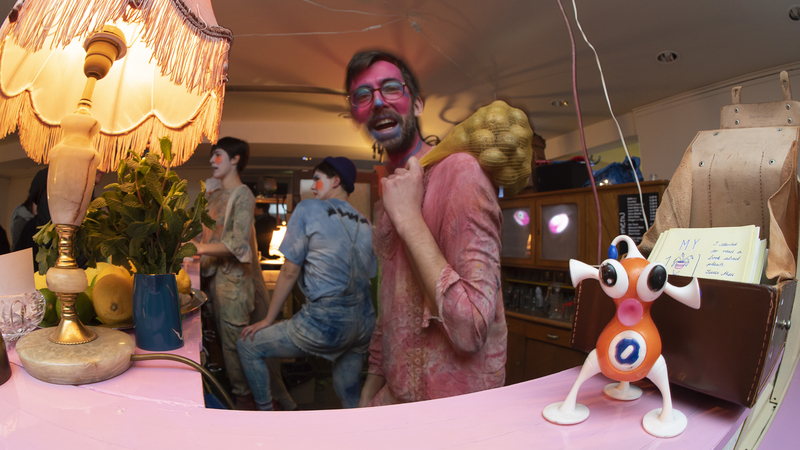 The Clown Café is a performative location offering snacks and beverages. The clowns have their own logic to fulfill the customers’ wishes. Here, one gradually drifts into a different temporality, in which brief, intimate encounters take place that last considerably longer for all those involved than the head of the beer. The future of communication – alienation – downstage. *Parametrical sound and movement manipulation of the projected images using custom-developped interfaces. *Inputs do not necessarily lead to expected outputs. *Causes do not have predetermined consequences. Based on this concepts the project UNSURROUNDED started as a solo performance project were sound, movement, visuals & words intercollide. Each presentation is different with new inputs on the material layers and with new interactions that can extent to collaborations with other performers, musicians, visual artists and all kind of art houses and individuals (animals included). Counter-narratives are narratives that elude a dominant narrative in order to rewrite it. A number of art projects distinguished by a different interpretation of historical events that deviates from the predominant view or formulates a different claim to reality will be presented and discussed. They explicitly engage with social values, such as tolerance, openness, and freedom, and offer implicit or explicit resistance. In addition, the potential of (video) art as a tool of empowerment and participation will be discussed. Mapping is a political act, and so are our everyday movements and interactions with the city. Within this intersection of geometries that are drawn, and geometries that are performed, we will create a common cartographic representation of places of memory, love and ritual, to explore how sense of belonging and collectivity is created in the global city. Please apply with the name of the city that you will work with. The panel focusses on current artistic works based on the adaptation of documentary or journalistic techniques. Of interest are strategies to generate counter-narratives and thus a counter-public, as well as the reflection on one’s own artistic practice in the sense of a form of truth that is also constructed through media. How do narratives of the documentary and the media-based arts interact, and what signs of new image languages can be discerned? In this lecture, the setting of airport security is reimagined through the genre of body horror cinema, with body scans and biometric meshes as key protagonists. These digital bodies—extracted from embodied selves—are inspected, prodded, and probed for the sake of risk preemption, but how do such acts come to provoke or terrify, when—no matter how violently handled— the digital renderings of securitized people appear to be free of the horrors of bodily violation? 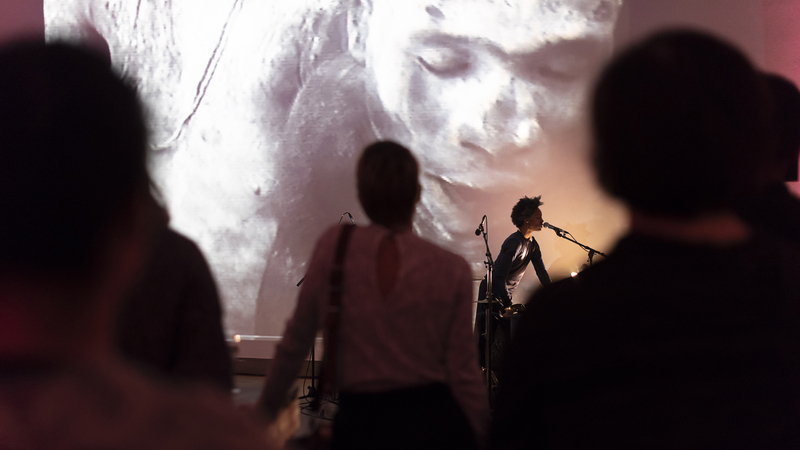 Artists of V.17 speak about their work. In English or German Language. 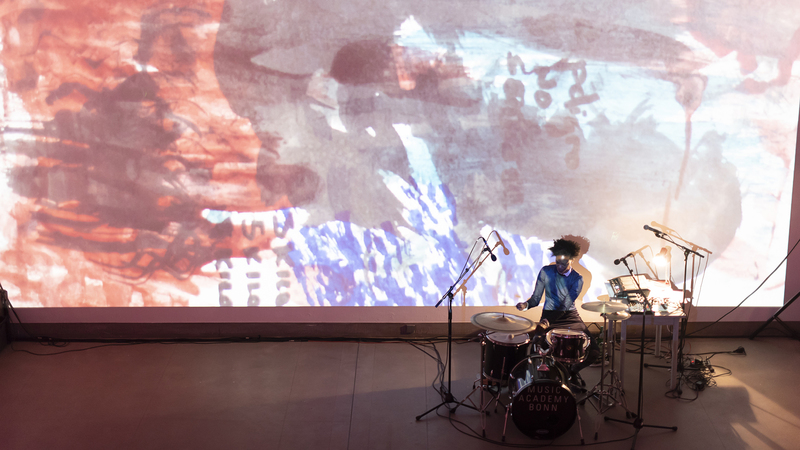 ›Xiaoqing‹ translates into ›small green,‹ a bizarre live music-video prose. Like the small green snake in the fantastical story, this performance is about two immortal snake ghosts. ›Xiaoqing‹ is also the nickname that the artist was given as a child. 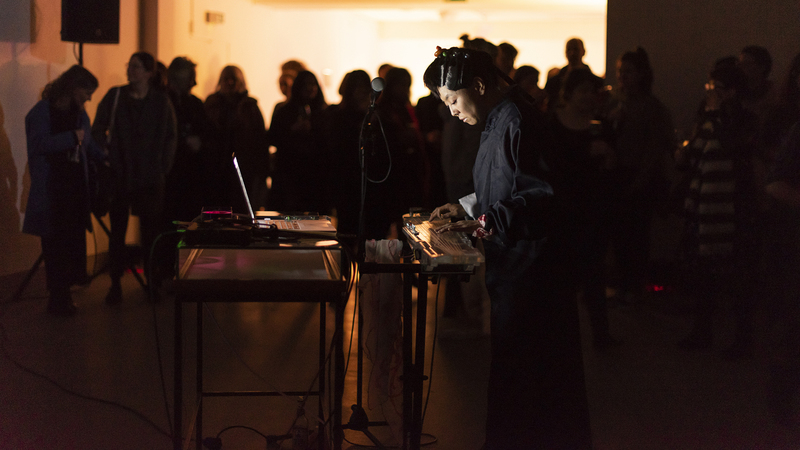 On stage, Xiaoqing is a shaman who transfers the “memories that have crept in” to an ›ephemeral tapestry‹ in sound and vision. The story she tells is at once autobiographical and collective: the perception of faith, identities, and technologies, as well as metamorphoses of bodies and living spaces amidst the global environment. Kame House Records is run by Infuso Giallo and uomo di carne. Although the label was founded in 2017, Kame House has been around much longer as DJs and as an idea. Besides their residency in the legendary Cologne pop-up club K5 (e.g. together with I-F, Traxx, Bufiman, Lena Willikens, Moscoman), the two DJs played at locations all over Germany. Musically, the output is not committed to one genre, but rather to exotic eclecticism. To present one’s own time-based art projects in a portfolio always implies translating them into a new medium. Based on the portfolios of the workshop participants, we will discuss the various approaches to visually and audio-visually presenting one’s time-based art, to then develop documentation and presentation strategies in a targeted way and discuss the portfolio as a format for self-presentation. How can new digital technologies contribute to our future cities as open, safe and free environments of inclusiveness and democratic decision-making processes? With video surveillance, cities turned into technologically enhanced structures where safety is sometimes at odds with privacy. The latest technologies make it easy to interact with our urban environments and navigate them, but when we access information there is also data extracted from us. What kinds of regulation should be developed to protect us from abuse? How can city governments and citizens benefit from creating digital doubles of cities and how can these virtual replicas enhance citizen participation? How does the use of 3D models and simulation determine the kinds of governance and control that authorities apply? 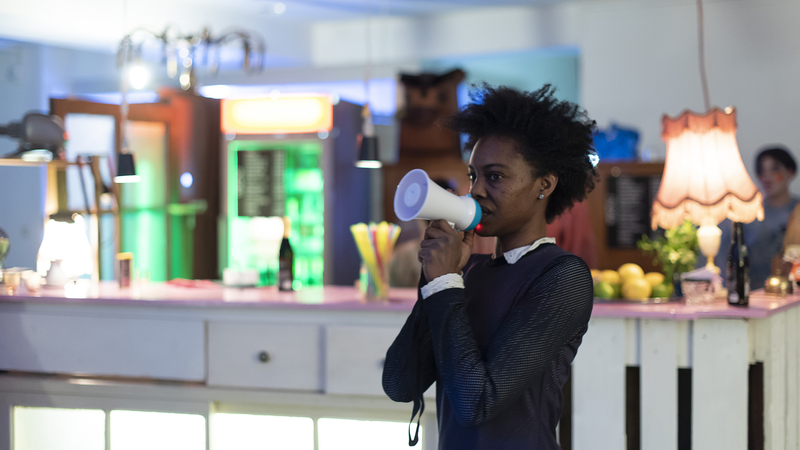 What does protest and civic disobedience look like in the digital city? And how can we make sure that augmented realities are applied in ways that keep the digital public space free and open and not colonized by commerce? The Panel takes place in cooperation with IMPAKT Festival and Centre for Media Culture Utrecht. Lecture: Dr. Thomas Christian Bächle, Refracted Humans – The Rise of Artificial Man? Humanoid robots often feature many characteristics of a so-called artificial intelligence we find both fascinating and disquieting. They learn, make autonomous decisions or process information much faster than humans. Robots are, however, more than just a computer-based intelligence: With their own mechanical body they are capable of interacting with the world. Their human-like appearance even allows them to be social beings, our companions and partners. They mimic our feelings, they mirror the way we think of ourselves – as refracted humans. Exhibition architect Ruth M. Lorenz and artistic director of V.17 Tasja Langenbach speak about the exhibition display. The panel examines the influence of internet culture on visual art, placing a focus on artworks produced for the internet as well as alternative models to the status quo. What democratizing potentials does the internet possess, how does it alter our notions of reality, individuality, originality, identity, and truth? 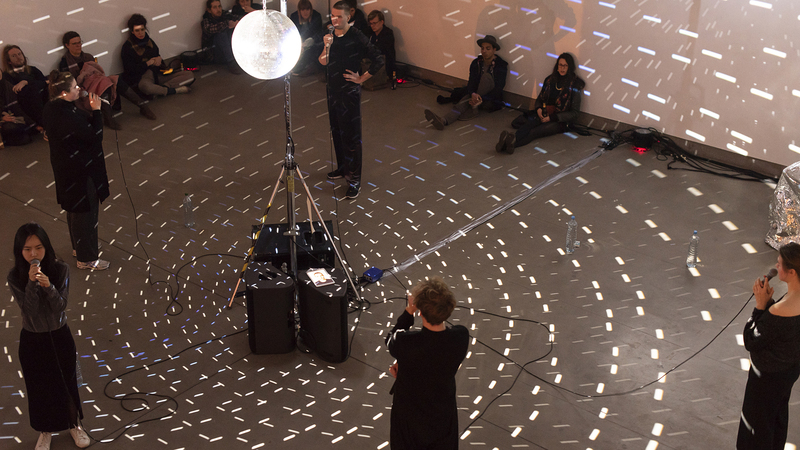 Light is also to be shed on questions related to surveillance and resistance, as well as the control of images and information. In 2017, ArtReview voted Hito Steyerl the most influential person of the year in the world of contemporary art. In this field, women seem to be more present than ever, yet they must invest considerably more to be on a par with their male colleagues. How has the position of women—artists, curators, producers—developed in the past decades in art? What has changed after the second and third wave of feminism? In addition to the structural function of institutions (emotive keyword: ratings), a special focus is placed on the perspective of female producers. 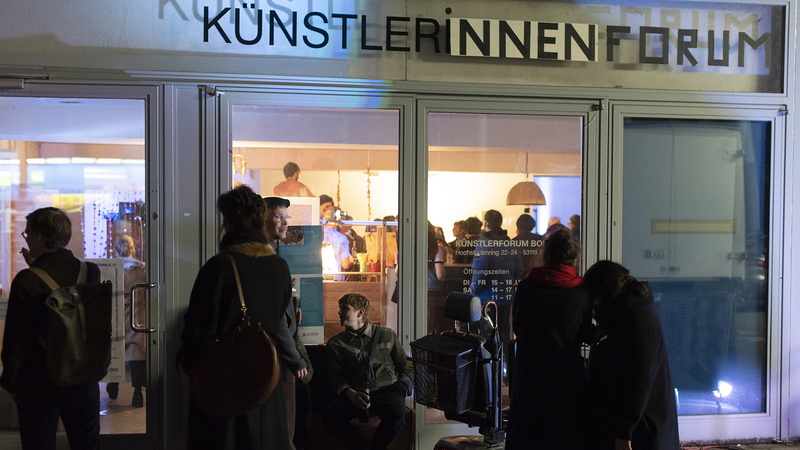 The Panel takes place in cooperation with Landesbüro für Bildende Kunst. This program compiles a selection of works which have been supported or co-produced by the European Media Artists in Residence Exchange (EMARE) of the European Media Art Platform (EMAP) and Werkleitz Professional Media Master Class (PMMC) dealing with this year’s videonale’s topic Refracted Realities in both meanings, the figurative sense, examining our perception of our surroundings and landscapes like in Dunkeldeutschland by Stefanie Schröder and Juliane Jaschnow (D 2013), our society like Leopold Kessler does in Zaun Schärfen (Fence Sharpening) (D 2010), our You Tube media channels and the way we reflect on ISIS propaganda like Chloé Galibert-Laîné and Kevin B. Lee elaborate in Bottled Songs 3 & 4, the vanishing of things or even nations like Doug Fishbone in Artificial Intelligence (D/UK 2018) or in the optical sense, how light waves alter course, changing the way we perceive the objects it illuminates in the process like in Florian Fischer’s and Johannes Krell’s newest work: Umbra (D 2019). On the occasion of VIDEONALE.17 – Festival for Video and Time-Based Arts, the gkg, as a long-standing cooperation partner, focuses on the topic of exhibiting moving images and dedicates a solo show to Ruth Lorenz, the exhibition architect of the VIDEONALES.15-17. Inspired by the theme of the prism as a refracted body of light, Lorenz conceived an experiential space for the gallery rooms of the gkg, in which visitors can retrace various modes of experiencing space based on sketches and spatial elements. As part of the opening: Talk between Ruth Lorenz and Prof. Andreas Denk (Chairman gkg). 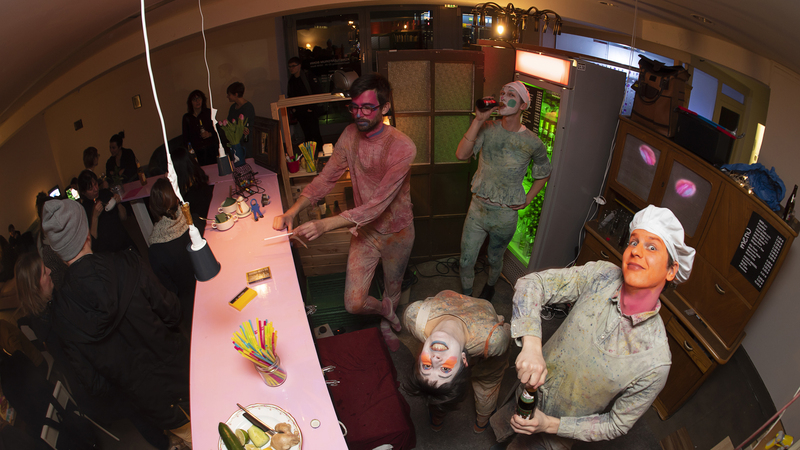 ›You Are‹ is a Cologne-based performance collective which discusses forms of collective thinking and narrating. Their language-centered performance YOU ARE bases on a simple algorithm and changes constantly between confession and interrogation. In a rhythmic succession political and private statements dissolve in their tonal qualities and new contextual connections are consecutively generated.